I received this polish from Born Pretty Store to review. It is a pretty glitter topper with various matte white glitters in bars and different sizes of hexes, plus large flower glitters in a few different colors. The polish isn't very dense with glitter, so I had to sponge on the white pieces and fish the flowers out to place individually, but it is really cute! I put the glitter over Anonymous Lacquer Black Dagger for a lot of extra holo sparkle! I think my favorite part of this polish is the cool velvet texture design on the cap and the bottle shape! I'm not a sucker for packaging, but it is definitely one of the cutest styles of bottles I've ever seen! A short and sweet post for me today. 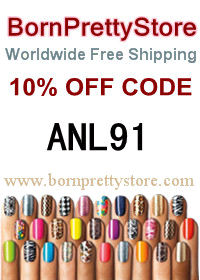 If you shop Born Pretty Store, use my code ANL91 for 10% off regular priced items.